I strongly believe that vacations are necessary to keep people balanced. Too much work results ultimately in too much stress and in turn, this translates often into a lack of caring for one’s self. The “workaholic” will tend, over time, to burn out both psychologically and physically. Part of the fun of a vacation is “vacationing” away from things in your life that are not fun. We often search for destinations that are different than our everyday environments (I doubt that people that live at the beach seek a beach vacation), sleep in much later than our daily routine allows for, not shave/get dressed up professionally and stay up much later than the norm. And yes, part of the “vacationing mindset” is allowing one’s self to eat/drink in hedonistic ways. There are many people that actually choose vacation spots based on the great food (France, Rome, New Orleans as examples) and/or great booze (wine country in the United States, wonderful vineyards internationally). 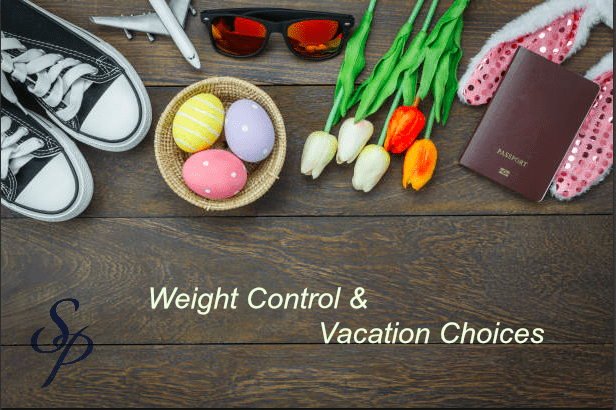 Here is my suggestion for approaching vacations and the “vacation mindset”: First, do NOT think of your weight control efforts as somehow punative; a sort of “dietary prison”. In any given year there will be the birthday week, the Holidays and yes, vacations. It is perfectly fine if you stray off the SP dietary plan and eat/drink sources not compatible with one of the dietary phases. Try to choose vacation venues that are NOT the “All You Can Eat” environments such as cruises. Also, make use of the extra time for fun walks or even the gyms in the spas that man places offer. Unlike the daily routine when it is shower and work time after your work out, look forward to time in the hot tubs and saunas to relax after your exercise. No big deal if weight gain on vacation occurs: Simply recommit yourself to your efforts upon your return. See what happened on the scale and then plan how long Phase 1 is required before you get back to where you were before the vacation. P.S. I just returned from a 3-day vacation with my family spent at Great Wolf Lodge. Lunch at Sonic was not exactly Phase 1 compatible! Oops…off to the elliptical for some extra work out time for me!